The Club’s 31 self-catering apartments are spread over a 260 unit architecture prize-winning complex amongst gardens that provide a beautiful setting for the magnificent swimming pools. 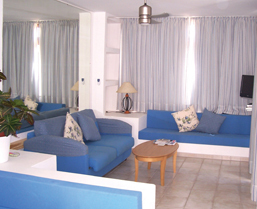 This resort is located in a very quiet area that allows mature travellers to enjoy a peaceful holiday. The units are very spacious each with large private terrace allowing maximum enjoyment of hot winds from the Sahara as well as cooling winds from the Atlantic. The units all have air-conditioning, a fitted kitchen and free cable television. Club Los Molinos is situated at the entrance to Costa Teguise, which is a stylish tourist area on the east coast of the unique volcanic island of Lanzarote. The Costa Teguise pale sandy beaches are uncrowded and there is a golf course, water park, cactus garden, sports facilities and varied nightlife. You can explore the north of the island from here, visit the incredible volcanic caves at Cueves de los Verdes or the ancient capital and its Sunday mega-market. Most of what will be seen will leave the discerning traveller breathless. Many keep coming back.